We have lots of resources to help you learn about and use EB GUIDE. We update this page as we develop new resources, so check back often. If you’re new to EB GUIDE, we suggest you try the Getting Started page and then go to our documentation. Learn more about all EB training and event opportunities. This demo showcases the different EB GUIDE 6 features that can be used to create infotainment systems or cluster instruments. See the different buttons and sliders you can use in your project. 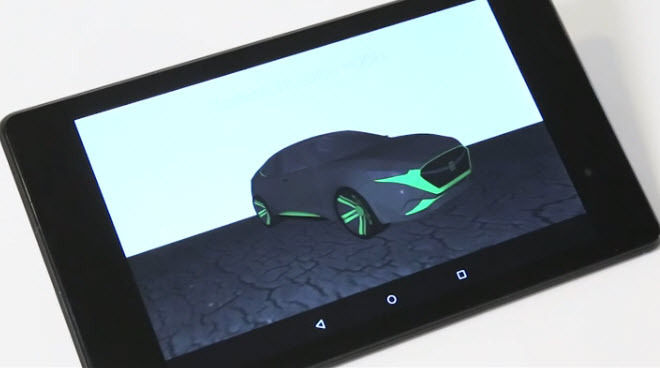 View the EB 3D car in motion. Use the Settings tab to change language. Now updated with pop ups and demo mode. Version 6.7.3 required. A collection of ready-to-use examples for creating EB GUIDE extensions such as custom widgets, concepts such as the EB GUIDE GTF plugin and EB GUIDE interactions. Version 6.7.3 required. A collection of ready-to-use examples for creating EB GUIDE Monitor extensions. Source code samples show how to create your own component, send events, read or write datapool values, or access the scene. Download the examples, unzip the file, and check the readme files for more information. Version 6.7.3 required. The new widget template library offers templates for the most common widgets (buttons, lists and sliders) that are used in an EB GUIDE project. With the library, design is easier, iterations are quicker and customization gives you the edge that makes your product stand out. Download the widget template library project, unzip the files and open EB GUIDE Studio (version 6.7.3 required). You can find all the templates in the navigation area. Click through the templates to see the properties of each template. (Video) This tutorial shows you how to model a reusable pop-up dialog box using a dynamic state machine. The pop-up dialog box is activated when clicking a button. Depending on which button you click, the pop-up dialog box has different content. In this tutorial you learn how to use a haptic dynamic state machine, datapool items and EB GUIDE Script. To follow this tutorial, download this demo project and use it as starting point for the video tutorial. After finishing the tutorial, you can open the second demo project called Solution and compare your result with it. EB GUIDE offers the possibility to use 3D graphics in your EB GUIDE model. This tutorial guides you through the process of importing a 3D graphic and modifying the appearance of it using widget features. Working through the tutorial takes you around 15 minutes. (Video) This tutorial shows you how to model an animation that is played when a button is clicked. The animation also triggers the transition to the next screen. To follow the tutorial, download this demo project and use it as starting point for the video tutorial. After finishing the tutorial, you can open the second demo project EB_GUIDE_6_Animations_solution and compare your results with it. (Video) This tutorial shows you how to model a speech dialog, which is how EB GUIDE implements speech input and output. Create a dialog where the user says a color and the HMI reacts to the user’s speech input by changing the screen’s background color. To follow the tutorial, download this demo project and use it as starting point for the video tutorial. After finishing the tutorial, you can open the second demo project called Solution and compare your results with it. This tutorial guides you through the process of adding and configuring an SSML prompt. SSML prompts let you configure speech output with a specified rate of speaking. Working through the tutorial takes you around 10 minutes. The associated EB GUIDE project with its speech user interface is downloadable as a zip file. It includes a view state with a button to start the speaking with the SSML prompt. This tutorial guides you through the process of configuring a command with a datapool slot. A datapool slot is a placeholder that SRGS grammars can refer to. You create a speech dialog in a view state with a button to start the speech, after which the user can select between different radio stations using commands. Working through the tutorial takes you around 10 minutes. The associated EB GUIDE project with speech user interface is downloadable as a zip file. 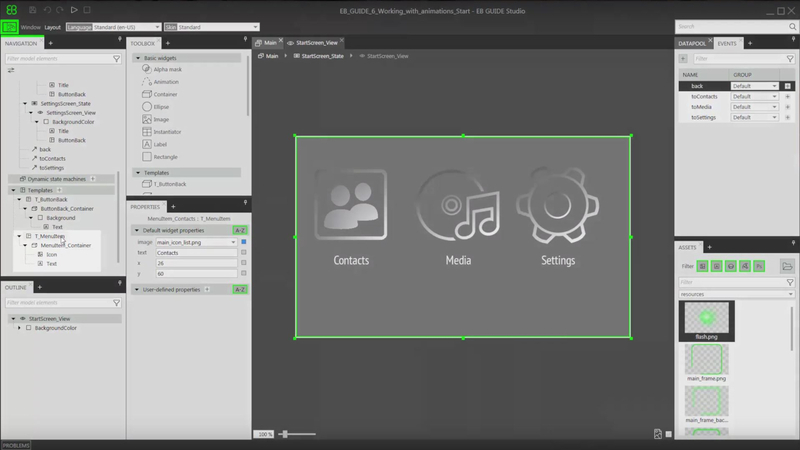 (Video) Shows how to create a widget template based on a container, rectangle, and a label. Use templates to inherit or combine complex model elements and build a widget library. To follow the tutorial, download this demo project and use it as starting point for the video tutorial. (Video) Shows you how to modify the widget properties of a template. Change the template you created in the demo project with EB GUIDE Scripts. Download the demo project EB_GUIDE_widget_templates_basic and use it as starting point of the video tutorial. After finishing the tutorial, you can download the demo project EB_GUIDE_widget_templates_advanced and compare your results with it. (Video) Provides an overview of the new UI components in EB GUIDE Studio 6, including the Project Center, Project Editor, Navigation Area, Content Area, Toolbox, and the Properties Panel. (Video) This tutorial shows how to install components on your Android target device in order to run an EB GUIDE 6 model. 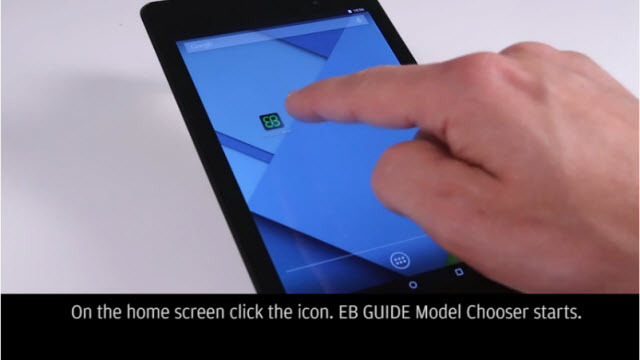 The video also explains the two Android apps: EB GUIDE Launcher and EB GUIDE Model Chooser. To follow the tutorial, you need to have the SDK for the Android target framework installed. The SDK installation file sdk_android_14_armv7.exe usually comes along with the download files for your EB GUIDE Studio installation. If you do not have the SDK installation file available, you can download an archive containing the SDK file from here. 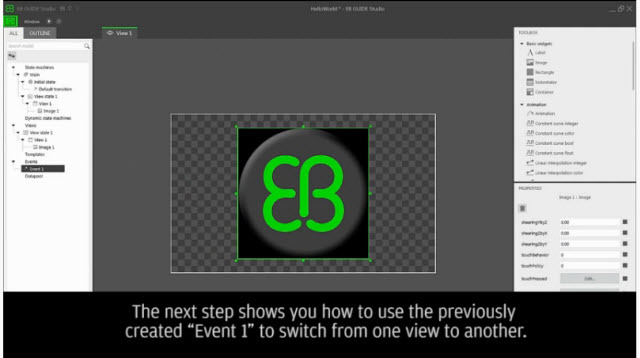 (Video) Shows how to export an EB GUIDE model from EB GUIDE Studio and how to deploy and run the model on an Android device. Learn how to bring a model created in EB GUIDE from your PC to your Android device and see it run on this target environment. To follow the tutorial, download these supporting files. (Video) Shows the basic steps for starting a model in EB GUIDE Studio 6, including creating a new project, using states, transitions, views, widgets, events, and properties. To follow the tutorial, download this supporting image file. Path gestures are shapes drawn with a finger on a touch screen or entered by some other input device. This tutorial guides you through the process of modeling a path gesture. Working through the tutorial takes you around 10 minutes. The associated EB GUIDE project is downloadable as a zip file. With EB GUIDE Script you can express property values, actions, or conditions and evaluate them during run-time. This tutorial guides you through the process of using EB GUIDE Script to model the behavior of a button, which increases in size when clicked and shrinks back to its original size when it reaches a defined maximum size. Working through the tutorial takes you around 10 minutes. The associated EB GUIDE project is downloadable as a zip file. Dynamic state machines allow pop-ups during run-time, for instance, to display error messages that overlay the regular display. This tutorial guides you through the process of creating a dynamic state machine for volume control. Working through the tutorial takes you around 20 minutes. The associated EB GUIDE project is downloadable as a zip file. This tutorial guides you through the process of animating an ellipse widget so that it continually moves across the screen when the simulation starts. Working through the tutorial takes you around 5 minutes. The associated EB GUIDE project is downloadable as a zip file. Instantiator widgets allow you to create lists dynamically at run-time. Based on a list type datapool item, an instantiator displays all list elements in a pre-defined layout. If the content of the datapool item is modified, so is the appearance of the instantiator. This tutorial guides you through the process of creating a list of labeled rectangles with dynamic content. Working through the tutorial takes you around 10 minutes. The associated EB GUIDE project is downloadable as a zip file. Image-based lighting (IBL) is a technique to illuminate virtual 3D objects within a scene using lighting information of the real-world environment. This tutorial shows you how to use IBLGenerator to create a data set that is used as an image-based light and how to work with the image-based lighting in EB GUIDE Studio. Working through the tutorial takes you around 10 minutes. This tutorial guides you through the process of performing the gamma correction. Gamma correction affects color reproduction on the screen as well as image color storage. Gamma expresses the relationship between color values and the perceived intensities on the screen. 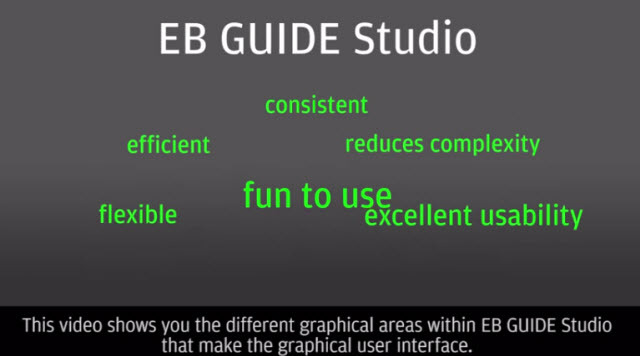 In EB GUIDE Studio, you can perform the gamma correction for a display, an image, or a texture. Working through the tutorial takes you around 15 minutes. EB GUIDE allows you to display text in the user’s preferred language. This tutorial guides you through modeling a label that changes to accommodate an English, French, and German user interface. Working through the tutorial takes you around 10 minutes. The associated EB GUIDE project is downloadable as a zip file. Your HMI is like a sixth sense—another way for your customers to interact with the world, access information, and exert control. The better the HMI, the more power you give to users. 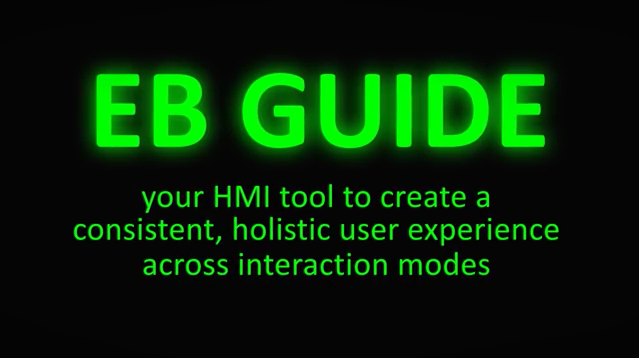 EB GUIDE is your key to unlocking the sixth sense by building natural, intuitive, effortless HMIs. In this video you can see the flexibility of our Human Machine Interface (HMI) development tool EB GUIDE 6. It is well known for modeling Automotive and Industrial HMIs, but now you can see how it was even used for developing Human Robot Interaction (HRI). During his bachelor thesis a student modeled the speech dialog flow and gestures for the robot “NAO” with our tool. 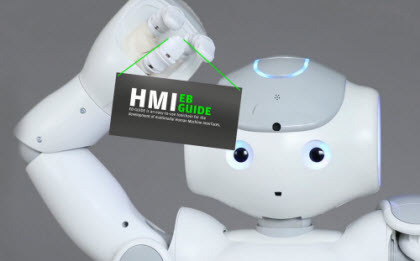 Learn more about HRI and let NAO introduce you to EB GUIDE. This PDF provides full documentation of EB GUIDE 6.7.3 for designers, developers, and integrators. It covers using EB GUIDE Studio to create models, simulating the model, and working with applications and extensions. Details of the EB GUIDE release. Download this helpful quick reference card to begin using the built-in scripting language in EB GUIDE. The card includes feature descriptions and syntax examples for typical tasks. The diagram illustrates EB GUIDE components and explains how a model built with EB GUIDE runs on a target device and works with third-party applications and devices. This document describes the different widget templates that are available for use with EB GUIDE 6.7. It accompanies the widget template library file that is free to download in our Download section. 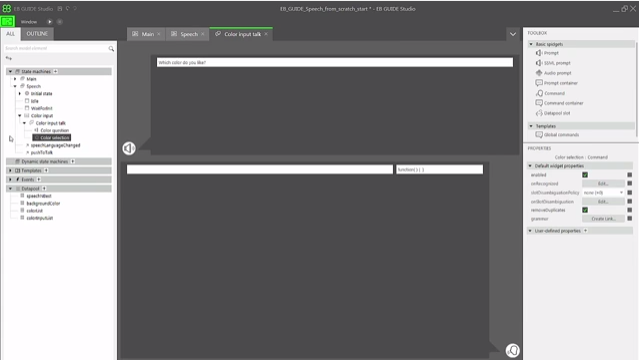 EB GUIDE allows you to create outstanding user interfaces that can be enabled with voice. You can use its easy-to-use interface to design the next-generation of speech within the car – one that employs the power of hybrid speech architecture, combining embedded with cloud-based technologies. Find out more about EB GUIDE Speech Extension.